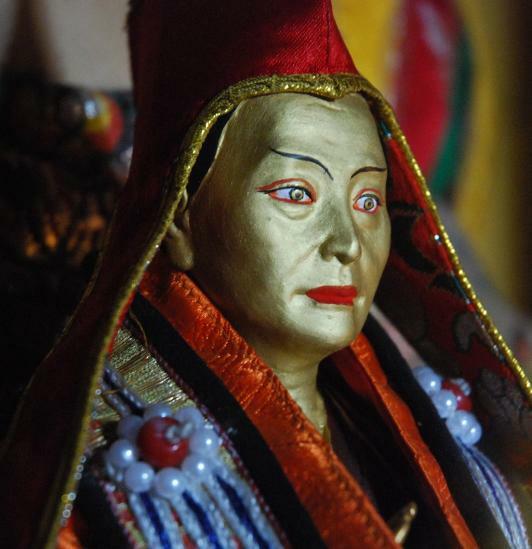 When Venerable Atiśa came to Tibet he first went to Ngari, where he remained for 3 years giving many teachings to the disciples of the King Changchub Ö.
and Changchub Ö requested him to give one last teaching before he left. Atiśa replied that he had already given them all the advice they needed, but Changchub Ö persisted in his request and so Atiśa accepted and gave the following advice. Friends, since you already have great knowledge and clear understanding, whereas I am of no importance and have little wisdom, it is not suitable for you to request advice from me. However because you dear friends, whom I cherish from my heart, have requested me, I shall give you this essential advice from my inferior and childish mind. Since you cannot become a Buddha merely by understanding Dharma, practise earnestly with understanding. Avoid places that disturb your mind, and always remain where your virtues increase. Until you attain stable realizations, worldly amusements are harmful, therefore abide in a place where there are no such distractions. Since there is never a time when worldly activities come to an end, limit your activities. Dedicate your virtues throughout the day and the night, and always watch your mind. Because you have received advice, whenever you are not meditating always practise in accordance with what your Spiritual Guide says. If you practise with great devotion, results will arise immediately, without your having to wait for a long time. If from your heart you practise in accordance with Dharma, both food and resources will come naturally to hand. Friends, the things you desire give no more satisfaction than drinking sea water, therefore practise contentment. Profit and respect are nooses of the maras, so brush them aside like stones on the path. Words of praise and fame serve only to beguile us, therefore blow them away as you would blow your nose. Since the happiness, pleasure, and friends you gather in this life last only for a moment, put them all behind you. Since future lives last for a very long time, gather up riches to provide for the future. You will have to depart leaving everything behind, so do not be attached to anything. Generate compassion for lowly beings, and especially avoid despising or humiliating them. All happiness comes from the blessings of your Spiritual Guide, therefore always repay his kindness. Since you will definitely have to depart without the wealth you have accumulated, do not accumulate negativity for the sake of wealth. Distracting enjoyments have no essence, therefore sincerely practise giving. Always keep pure moral discipline for it leads to beauty in this life and happiness hereafter. Since hatred is rife in these impure times, don the armour of patience, free from anger. You remain in samsara through the power of laziness, therefore ignite the fire of the effort of application. Since this human life is wasted by indulging in distractions, now is the time to practise concentration. Being under the influence of wrong views you do not realize the ultimate nature of things, therefore investigate correct meanings. Friends, there is no happiness in this swamp of samsara, so move to the firm ground of liberation. Meditate according to the advice of your Spiritual Guide and dry up the river of Saṁsāra suffering. You should consider this well because it is not just words from the mouth, but sincere advice from the heart. If you practise like this you will delight me, and you will bring happiness to yourself and others. I who am ignorant request you to take this advice to heart. This is the advice that the holy being Venerable Atiśa gave to Venerable Changchub Ö.